At 1:48 pm on April 20, 2019, the iceboat season on Minnetonka ended. Coincidentally, this is the exact same moment that the Water Patrol declared Minnetonka to be ice free. You now have plenty of time to work on your gear. Mike Madge has been really tearing it up this week in Thunder Bay. Plenty of ice left. This coming weekend looks pretty promising. Freezing at night, nice warm springtime sailing temperatures during the day. Looks good to me. Anybody else interested in a spring road trip? My marks are in the trailer. How about a 10 lap Canadian free for all!! Sorry, folks, but the end is near. First, the “Powers-To-Be” moved up the the first day of spring. We traditionally celebrated the beginning of spring on March 21. Now, however, astronomers and calendar manufacturers say spring starts one day earlier, March 20. By my calculations, that’s one day of sailing we will never get back. Ron Sherry held of the Pols and many other talented sailors to win the 2019 North American Championship. The regatta was held on Lake Wawasee in Syracuse Indiana. Evans and Dennis finish in top ten. Bloom finishes 16. Congratulations to Poland's Michal Burczynski (P114} who won the Gold Cup in a borrowed boat when his equipment never made it onto the airplane! The regatta was held on Lake Indian Hills, Ohio. Results and Michal’s speech- worth watching. Take a lap around pepin on Merlin! Not very bright Australian left a DN Runner on the ice on Friday afternoon, January 11. To the left of where the road hits the ice by the yacht club. Ancient runner from antique (now 2 legged) DN. if anyone found it, can you give me a quick call on 612 231 5616. It’s On! The Western Regional Championships are confirmed for this weekend, Jan. 5-6 on Lake Pepin in Lake City, Minnesota. 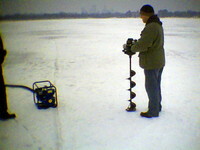 checked ice fri noon. quite smooth but still needs freezing as water under top layer of ice. should be good by sun as quite cold fri night and sat. should be checked again sat by harrys for sailing sun and mon before pos snow mon. Ice needs to be checked before sailing! !